If you would like to explicitly communicate on a project, the RACI matrix can help with that. RACI organizes your project so that everyone knows what’s happening. With RACI, map out who is Responsible, is Accountable, must be Consulted with, and shall stay Informed. Lets break it down further. Here is what your project delegation looks like with RACI. Responsible – Who is completing the task. Accountable – Who is making decisions and taking actions on the task(s). Consulted – Who will be communicated with regarding decisions and tasks. Informed – Who will be updated on decisions and actions during the project. Need to see more about RACI? Download the RACI Chart Guide & Templates – Free. If you are interested in downloading your Free RACI Guide, that’s great! To do this by accessing your dashboard and you will see RACI Matrix Guide + Templates at the top. Even the Project Management Body of Knowledge (PMBOK Guide) has a section for RACI under matrix-based charts. The PMBOK uses RACI as an example of a Responsibility Assignment Matrix, RAM. A RAM serves the purpose of showing which activities belong to each team member. For more information about the PMBOK Guide, we wrote an article for you. Let’s understand RACI better with a simplified example. John is developing software feature X that will be integrated with software feature Y – developed by Jess. Mike is the project manager and Irina is in marketing. For feature X, John is responsible, Mike is accountable, and Jess needs to be consulted with as her feature will integrate with John’s. Lastly, Irina simply needs to be informed when the task is complete. It informs the organisation about its employees workload as it shows which role(s) are assigned to each person. For example, the organisation can see if someone has been placed in the responsible role too many times or not. In other words, does this person have a lot or a too few tasks to complete. That way, the organisation knows whether someone has too many or could take-on more responsibilities. Use RACI for the successful completion of a project as everyone impacted is in the loop. This reduces miscommunication and increases productivity. So, if a task was incorrectly completed RACI tells you who was involved and ultimately accountable. In short, RACI makes it easier for you to have the right conversation with the right people. In turn, saving everyone time. RACI Users: What do The PMs Think of this type of responsibility assignment matrix? This tool explains each person’s role, but the necessary action(s) for each role can be unclear. Some feel that it’s not clear whether the responsible or accountable plans the task. With that being said, you could look at RACI in this way – apply the matrix as deemed necessary. You choose if the responsible or the accountable plans the task. The consult role is unclear. The project manager and the person consulted need to decide whether the consulted will only give direction when asked or whether they will offer direction when they feel it is suitable, and make sure their input is implemented. It won’t fix a dysfunctional team. PM’s feel that the RACI matrix will not fix a team that has poor moral. Before RACI can be effective, you must have a team that has no issues. RACI is not a tool that fixes a dysfunctional team. RACI improves communication flow in a cohesive group. Is the responsible not accountable? There’s the impression that it’s the case as it is a separate role, hence, a different person. To reiterate, some feel that if the accountable and responsible are different people it means that the responsible is not accountable for his/her actions. Alternatively, this could be sorted-out between these two roles. RACI’s Variations and Alternatives – More Confusion or Benefits? 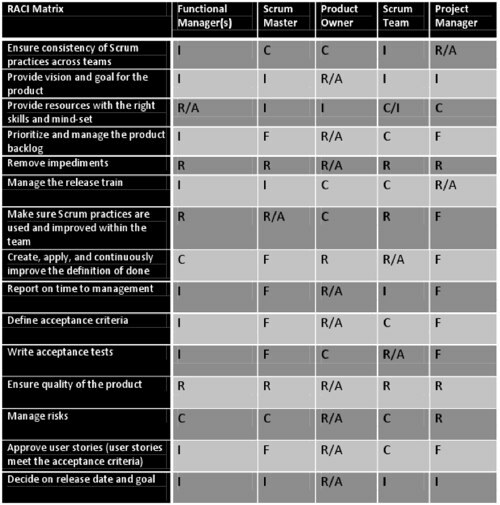 Depending on the setup of the project team, the RACI matrix has variations and alternatives. PMs criticize these because they feel that the variations/alternatives are trying to compensate for the matrix’s original design. If it had been designed well, one version of the matrix would suffice. On the other hand, having alternatives/variations to choose from means that the matrix is flexible to the team’s needs. RACI is a tool to organize team members in accordance with the goal of the project. If there are aspects of RACI that are too vague, consider that as an opportunity for the PM to think outside the “matrix”, aka box, and adapt this tool to his/her team – providing that is suitable. The final step includes a discussion with all the stakeholder and will be explained in the next part of this article. This is to ensure that the stakeholders understands their role. This is a recommended use of RACI for IT projects. Here is an example of how one PM used RACI in a scrum context. To meet the goal of the project, he added F to RACI: Facilitate activities. To summarize, the person in the F role, Facilitate, organized the activities for the scrum project as illustrated in the image below. The use of RACI in a scrum context stimulated an interesting discussion between PM professionals. Some felt that this model would provide recognition of a job well done, or blame of a poorly executed job, to one person – impacting team cohesion. This way of organizing would impact the fundamentals of Scrum – self organization. Counter arguments included, one must consider the extent to which RACI is applied. To use RACI to its potential, it is suggested that you find a balance between ridged roles and responsibilities, and flexibility in a self organizing team. Is that possible? Interested in a project management software that has a RACI Matrix + Work Breakdown Structure, then checkout PlanHammer – a combination of classical and agile tools with a Kanban board. As noted above this type of responsibility assignment matrix is effective. To know how to apply this model you should analyse, analyse, analyse! Balance is your key to success with RACI. If there are too many or not enough people in each role it slows down the completion of your project tasks or even prevents completion. One accountable per task. If you have more than one, it would be like having multiple people driving a car. It doesn’t work! If there is no driver, it will be hard to get that car to move forward – no decisions or action are taken on the project. The right amount of people responsible. Too many people assigned to the same task, and you have an excellent way to waste time. You also may get duplicate work. If you have a quick and simple task, the responsible could also be the accountable. Do not have too many consults: it could slow the task completion. If you need to consult with several people before completing your task, you have yourself another time waster. Or, conflicting input on how to complete the task. Keep people Informed. Perhaps you don’t need to consult with people, you simply need to update them. Make sure you have people in this role otherwise you could have problems relating to a lack of communication. How do you get the right balance with RACI? Make it a collaborative effort. Everyone should be comfortable with each role that they and their counterparts have. In short, improve communication and efficiency with the RACI matrix. Used to it’s potential, everyone wins. You will stop receiving unnecessary information, like an abundance of emails that you may not need to read. You will also increase job satisfaction with clearly defined roles. These first two videos provide you a short snippet of how RACI can work for you. Looking for a longer explanation? Watch video 3. 1. This a 5 minute video regarding the basics of RACI and how the program can benefit your organisation. Ready to Make Your Own RACI chart? 3. Take it even further with this video. This 20 minute video will walk you through how RACI will help you manage matters related to efficiency, accountability and role clarification. After you answer questions relating to your organisation, this RACI video takes you through a hypothetical situation about what it would look like if no one completed a task, and how RACI can manage it. In sum, it’s evident that a well organised team is crucial to successfully complete a project. A responsibility assignment matrix is advantageous, if not paramount, in achieving this. RACI has proven to be beneficial, yet it has its drawbacks. Still, consider that with any PM tool finding the one that works the best for you is key. I hope this article was beneficial. And now it’s your turn, I would like to hear from you. Have you used RACI? What has been your experience? 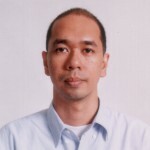 Jose is a subject matter expert and member of the writing team for Project-Management.com and Bridge24. He has written hundreds of articles including project management software reviews, books reviews, training site reviews, and general articles related to the project management industry. Next story Asana vs Trello – Which One is for Your Creative Team? Thank you. Very helpful article. Thanks for sharing; I just wonder if RACI is still commonly used? Years ago is was standard practice, but nowadays formal roles seems to just.. flow into more informal? It all depends upon the extent to which technical and commercial controls need to be applied and may also kick in at a financial level. thanks in advance for reply. Endorsement is a good approach where an intermediate level of consent is needed or required. E.g. purchases for a Project or Department where an Order Requisition is the basis for preparing Order documents. Project personnel or Dept. staff would be Responsible for preparing the detail of the Order Requisition (stating technical and commercial aspects). The Line or Project Manager responsible for technical aspects and the Dept. / Project budget endorses the Order Requisition to indicate they have reviewed it, all internal Budget / Project codes are included and correct and that it should proceed to order stage. The data entry clerk is then confident to spend time preparing the Order docs. Final review and / or endorsement of the Official PO can be done by Project people / Dept. staff and / or Line or Project Manager. Very good article to learn about RACI and worth to recommend to others. Great article! For the “A”s, are they typically the manger of the “R” for that given task? Typically perhaps. But in some cases, one part of the organisation is accountable for a result, but another part of the organisation might have the resources to do the work. In that case, I have seen RACI show R for the manager with the resources, not necessarily the actual resource. This is the best article i have ever read about RACI and its understandable. Is Agency Automation the Future? How are the complexities of Supply-Chain managed by Project Management? Searching for a PM Job?